ServiceNet is an innovative company, with exciting ideas, responsive staff and dynamic solutions. They came to us with a problem: how do we communicate exciting, responsive and dynamic to a public that tends to see human services as anything but exciting, responsive and dynamic? We sat down with ServiceNet’s team and looked at what they wanted a new website to accomplish. We discovered that communicating with the human side of the company, and connecting people with services were the two main goals for the site. Then we looked at who they wanted to reach. Given the range of ServiceNet’s services – from early intervention to supported housing and from psychotherapy to shelters – there was a broad spectrum of people to reach. It became clear that families, clients, staff, job-seekers, funders and community members all had a stake. And here is what it looked like at launch! We brainstormed what would be most welcoming to visitors and came upon the obvious: a friendly face. We took that as a starting point and ran with it. 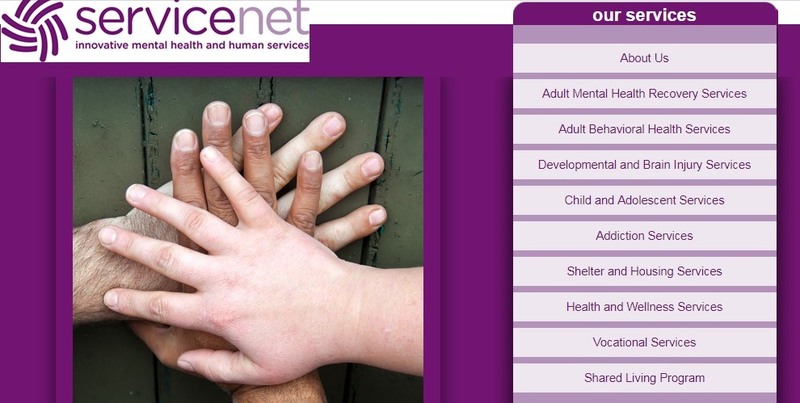 Human services are all about people, and what better way to connect with people than through images and stories of the people at ServiceNet? There were initial concerns about privacy, but maybe not surprisingly, clients and staff alike were eager to tell their stories and were proud to be pictured. When your life gets better, you’d want to let the world know how it happened! ServiceNet had been working on some branding updates for a couple of years. They were incorporating more color beyond their signature purple into their print media. Each service area – counseling, brain injury services, sheltering and so on – has a slice of the rainbow. We wanted to make sure to incorporate that dynamic palette to help create something beautiful. And then there was the user experience. We all wanted more than the existing series of stand-alone essays. 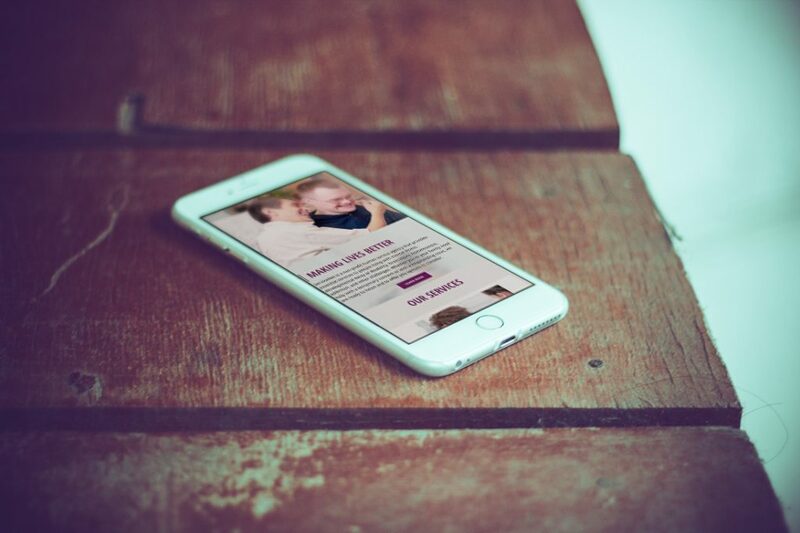 New features, including the ability to accept online donations, find the locations of services, and an engaging way of telling ServiceNet’s history became clear priorities as we planned the site. Now that we knew what we needed to accomplish, it was time to put together a site that would reach all those different constituencies. And we needed to do it in an easy-to-navigate, inviting package that would appeal to everyone on the list. Using more pictures of actual people helped to grab users’ attention. The folks at ServiceNet wrote copy that was not just a summaries of services, but actual human stories of people helped by people. We created an online donation area so it would be easier for their supporters to donate. They wanted to highlight Servicenet’s history so we added an amazing interactive timeline of ServiceNet’s development. Our design team created a beautiful skin to wrap it all up. In the end, working together, we designed and executed what one member of the ServiceNet team called an “amazing site! It just reaches out and grabs me, and then grabs me again!” The company has seen a rise in page views and time-on-page. There’s been an increase in donations. And they’ve received lots of positive feedback. from clients, staff, and community members. In the end, their original problem was solved. There can be no doubt that ServiceNet is exciting, responsive and dynamic.